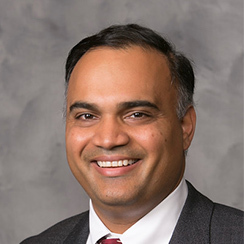 CCK Physician Dr. Pavan Reddy has been accepted as a member of the American Society of Clinical Oncology (ASCO) Practice Guidelines Implementation Network (PGIN). This committee of volunteers, who undergo a nomination and acceptance process, aid in the circulation and implementation of ASCO’s clinical practice guidelines in the oncology community. PGIN is also responsible for sharing ASCO’s evidence-based recommendations on cancer care with colleagues and other networks. The committee is made up of selections Clinical Practice Guidelines Committee members, State Society members, oncologists, and other disease site content experts with an interdisciplinary focus, oncology nurses, hematology/oncology pharmacists and oncology practice managers. ASCO promotes and provides for lifelong learning for oncology professionals, cancer research, an improved environment for oncology practice, access to quality cancer care, is a global network of oncology expertise and educates and informs patients with cancer. CCK is proud to have a team of physicians dedicated to enhancing the field of oncology through their involvement in organizations such as ASCO. To learn more about our physicians visit them here.